From what we’re hearing, the real story here isn’t necessarily what happened to Allee Bautsch and Joe Brown – though that’s a story in and of itself, for sure – but what that mob at Brennan’s did as a whole. 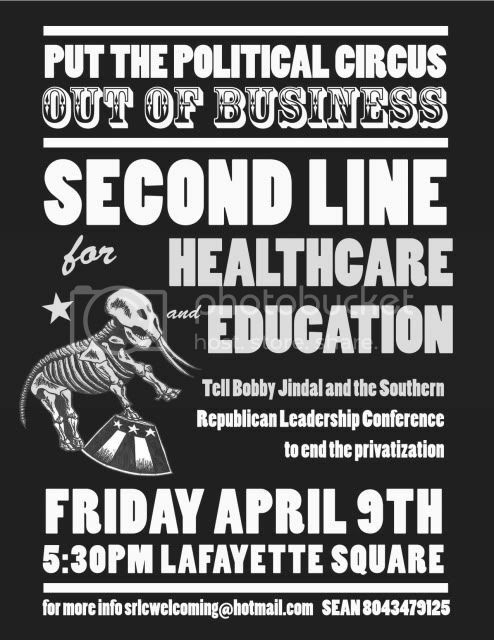 Ahhh… the f*ckmooks of the Southern Republican Leadership Conference are leaving New Orleans (or in the brothels or dragging their sorry asses along Bourbon Street trying to get laid) tonight. Good deal, the air will be much cleaner once they are gone. Yes they held their conference here in the very city that they wanted to let die after the Federal Flood in ‘05. It’s just their way of f*cking (in a different sense) us over again. I got shoved to the side by two rotund Repugs insisting that the sidewalk belonged only to them in the Quarter (and me walking with a cane). A blind man fared worse. They stared harshly at the very folk that are trying to rebuild our city with very little help. People who are just hoping to get lives back to a sane level. These a**holes are the ones who will drop $10K for a dinner with Piyush Jindal, the worm of a Guv’nor for the Gret Stet of Looziana, but never think of what $10K might mean to to a food bank here. I may just be a crazy witch, but I follow the teachings of a man called Jesus much more then they can ever do. I give a s**t about the World more than I do my “portfolio”. I’M HUMAN. Watch that hate speech, you right-wingers!